These pieces are contemporary renditions in the classic tradition of botanical illustration, which communicates, in an artful manner, as much information as possible about a given plant. They celebrate overlooked, undervalued, or threatened Northwest native wildflower species in the hope of increasing awareness and appreciation. Each of the plants portrayed has a special link with the human history of the region. Iris tenax. Tough-threaded Iris, Purple Iris, or Flag. This showy little wild iris, occurring in many shades of purple, is common in neglected fields and roadsides in the Willamette Valley in early spring. It was introduced into the formal world of botany by that intrepid Scot, David Douglas, the exploring naturalist whose name id commemorated in the Douglas-fir. "A plant forming close tufts of rigid, erect, linear-ensiform, evergreen, tough leaves, which in wild specimens are rather shorter than the flowers. Stem erect, a foot or rather more high, angular, leafy, clothed at the base with remains of the leaves, as in Allium victorialis. Ovarium on a long stalk, not enclosed within the floral leaves, somewhat 3-cornered. 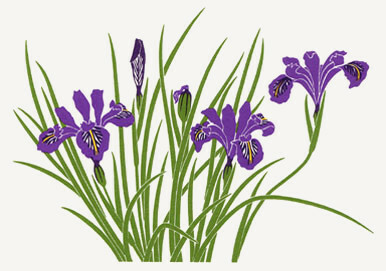 Flowers about the size of Iris virginica, sessile on the ovarium, dark purple, veiny; the outer petals obovate, acuminate, spreading, beardless; the inner obovate, rounded, erect, shorter than the others. Stigmas 2-lobed, short." "The native tribes about Aguilar (Umpqua) river … find this plant very serviceable for many purposes: from the veins of the leaves fine cord is made, which is converted into fishing nets; and from its buoyancy, great strength, and durability, it suits this purpose admirable. It is also made into snares for deer and bears; and a good idea may be formed of its strength, when a snare, not thicker than a 16-thread line, is sufficient to strangle Cervus Alces, the Great Stag of California, one of the most powerful animals of its tribe. The cordage is also manufactured into bags and other articles." Quotations are taken from Edward's Botanical Register of 1829.